Theodore Roosevelt is something you should read. Four United States presidents, George Washington, Thomas Jefferson, Theodore Roosevelt, and Abraham Lincoln are literally larger than life as they gaze out from Black Hills granite. A gaze that seems to reach the Badlands of South Dakota in the distance. You don't expect to see one of those presidents sitting in the theater specifically designed to be a view point for his likeness and that of three others. Particularly since the man appears to be Theodore Roosevelt, the 26th president of the United States who was born in New York City in 1858. Mr. Roosevelt was a happy and energetic man but faced trying times in his personal life. His first wife Alice, and his mother, died on the same day in 1884. For the next couple of years President Roosevelt spent most of his time on his ranch in the Badlands of South Dakota. Listening to President Roosevelt tell of earlier days, of hunting buffalo and wanting to be a cowboy you begin to believe your ears and eyes. This is Theodore Roosevelt and his interest and love of Dakota, The Badlands, and his country is sincere. He was back at one of his favorite places, the Black Hills on this day. Teddy, is that really you? You know how it is when you are somewhere and you see someone that you recognize, or at least you think you should recognize them? They look familiar but you just can't seem to put a name with the face. 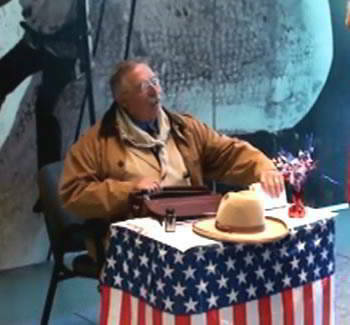 Sitting at a table in the visitor's center at Mount Rushmore National Memorial on September 5, 2011 was a gentleman that looked so very familiar. Wait a minute. . . That face is on the famous granite carving you can see through the window just over this man's left shoulder. You just never know who you will see at Mount Rushmore. You know you’ll see four presidents high on that granite ridge but will you see one of them in person? Teddy, that really was you.